Big Leather Couch: IT'S HERE!!!! This week, the players begin arriving from their homes around the world. Arriving in Ft. Myers, Tampa, Tempe, Goodyear, Mesa, Lake Buena Vista and some 14 other cities scattered throughout Florida and Arizona. The grass is bright green and the skies are a rich blue. The air is crisp and clean. No one has struck out, no one has blown a save. Some of these players are guaranteed to be one of 750 elite athletes with a job in major league baseball. (30 teams - 25 players on each roster). Some are here to try and win a job...try and at least get on a minor league team with the hopes of being able to play baseball and travel for hours in non-air conditioned buses, living on a $20 per diem...all for the game. They actually had the fifth best record in the majors last year. The team with the worst record? 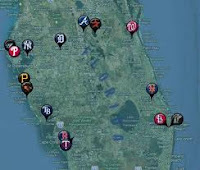 In Bradenton, FL, the Pittsburgh Pirates gather with the same feeling of confidence as the other 29 teams. Games are not played on paper, they are played on the field. The idiot is gone from my team. Can I get a hearty huzzah?? Moving from San Diego with season tickets to Padre games, I was actually rooting for the Giants. I always liked them. I'm here, but I don't see them coming yet. I'm not playing fantasy baseball this year. I hope that allows me to enjoy the games a little more. Also, can't wait to get past the Albert Pujols contract stuff. I know people will talk about it all season, but there won't be daily updates on discussions. I love Pujols and believe he should be the, or one of the, highest paid players, but 10 years? Sorry, that's just ridiculous. BARRY: In person or from the chair with a beer? JAY: I will play a couple of leagues, but not as many as before. Pujols...6 years tops..then put in a team/player option for two more years. Problem is, he is going to be old and might be a liability in the field and without the DH in the NL, what do you do then? SONGBIRD: Dear, you know that if I am going to Spring Training, it is in Florida...Tampa...Yankees!